As soon as the Sabbath was over, about 6pm on Saturday, and they were able to get to the market, Mary Magdalene, Mary the mother of James and Salome mother of Zebedee went out and bought spices and oils and began to prepare them. Why this immediate preparation? They went out very early the next day, just after sunrise to go and anoint Jesus' body. There is a sense of importance and priority about their actions. They want to get to Jesus and they want to do it first thing. When you know you want to spend time with Jesus do you make it a priority, are you prepared? What things get in the way of you being able to sit and spend time in Gods word and his presence? Is it chores, packed lunches that need making, dogs to walk, work? Like these women are there things you could do the night before in preparation? I find that I have a desire to spend more time in God's presence working on my relationship but there is a list of distractions as long as my arm that seem to take priority. What are these things that are so important and are they really? This morning, for instance, I got up grabbed the washing, filled the machine, unloaded the dishwasher, sat with my cup of tea and checked my emails and Facebook, before taking the dogs for a walk. How important are those things? What if I had remained relaxed, sat with my cup of tea and read a passage of scripture and then as I walk with the dogs mull over God's word. The dishes would still be in the dishwasher and the washing would go on an hour later but what would I gain? To start the day in the presence of God, to give him priority brings a peace and calm into my heart that rushing to get chores done does not. My day flows better when I give it first to God. Maybe you have young children making demands from the moment your feet slip out of bed, is there anything you can do to prepare them for a morning of play or distraction to give you a little time? If you need to get out the door to work, can you plan to have already made your lunch the night before or even consider getting up a little earlier just for God. To bear fruit and prosper we need to not only spend time with God but delight in his word and his presence. 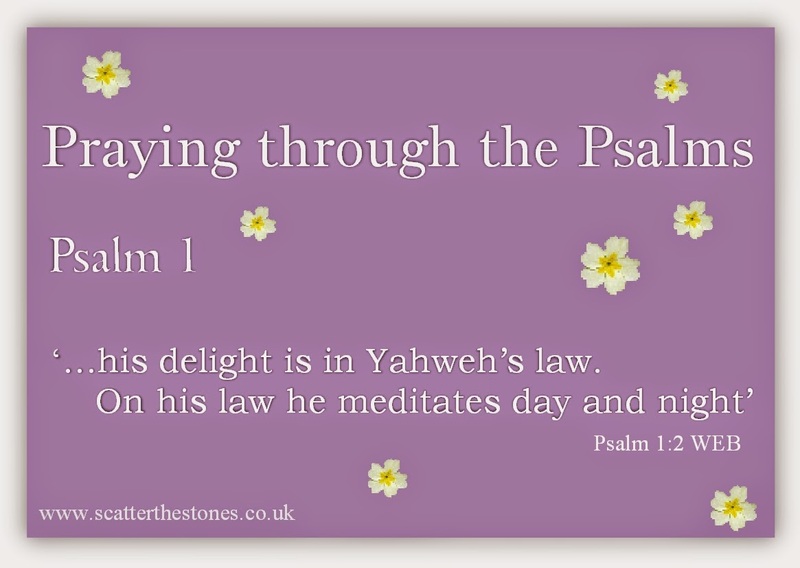 Today take Psalm 1 with you, if it helps use this devotional prayer from Praying through the Psalms - Psalm 1 from Scattering the Stones. Lord I thank you that you want to spend time with me and to you I am a priority. I am challenged by the preparation and priority that these women gave to you, I am inspired to see what I can change in my life. Lord, show me how I can make better use of my time to give you the best and the first of it. 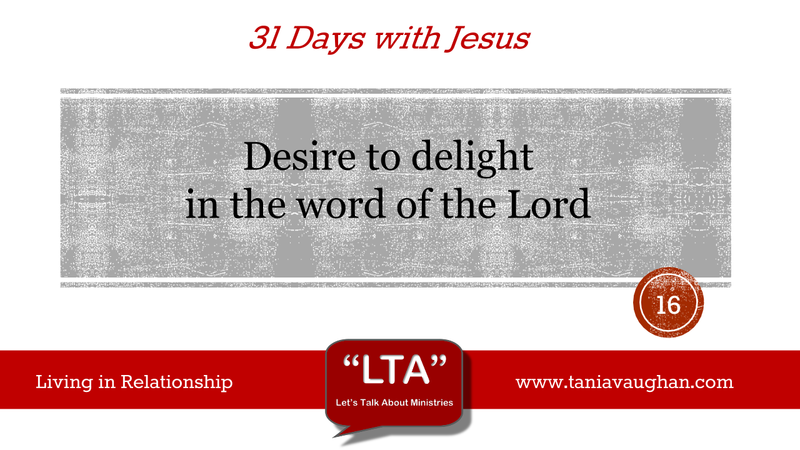 Lord, I desire to delight in your word. Investing in foundations is so important for a strong relationship. There are several images which spring to mind; see how a building relies on its foundations for its stability, or how strong would a mighty oak tree if its roots were not just as large as its canopy? But imagine the man who moves to a new area for a promotion say. New house, new neighbours, new community, new everything! Leaves his old network behind. If he doesn't invest time, energy and effort into building links and new relationships he will soon feel isolated and alone, unsupported. You see being a Christian is not a one way, take take take relationship. We seem to have developed this idea that God is some kind of spiritual safety net that gallops out to our rescue when we cLl on him. In reality we practice modern day idolatry with our iPhone or tv boxset and generate excuses that we are to busy or do not have the time to study the words of our own 'safety net'! We have to invest time to learn about what God wants for us if we expect to be of use in God's kingdom. Without growing strong roots in the good times how can we rely on them when times are bad? Thank you for your thoughtful post and for kindly linking to my prayer. The more time I spend with my Saviour, the more time I want to spend with Him. I know I can't manage without Him.